NEW YORK (CNNMoney) -- Stocks closed down more than 1% Wednesday, as investors continued to fret over how Europe could solve its debt troubles in 2012. Selling intensified ahead of the close. On a light trading week, investors have few other economic or corporate indicators to mull before 2011 ends. Still, traders and analysts said the low volumes led to more pronounced swings, and some of the moves are coming from year-end portfolio rebalancing rather than convictions over the trajectory of all stocks or a particular stock. "I don't know what to read into today," said Peter Boockvar, equity strategist at Miller Tabak + Co. "There's nothing going on in the U.S. market. It's a holiday week." The S&P fell back into negative territory for the year. 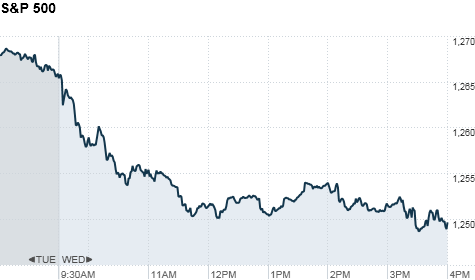 The Dow Jones industrial average (INDU) closed down 140 points, or 1.1%. The S&P 500 (SPX) slid 16 points, or 1.3%. The Nasdaq (COMP) lost 35 points, or 1.3% . Dragging down the technology sector Wednesday were RIMM, (RIMM) Netflix (NFLX) and Fossil (FOSL). The Nasdaq is down roughly 2% for 2011. Despite Wednesday's sell-off, the Dow remains up 5% for 2011. Some traders still hope to close the year poised for a January bounce. To get there, some say 1260 would be the magic number for the S&P to clear on Friday. "If we could clear 1,260 by the end of the week, we could see a strong rally in January," said Joe Bell, senior equity analyst at Schaeffer's Investment Research. If the S&P clears 1258 by year-end, it would mark the third straight year of gains. The index remains about 11% below where it closed at the end of 2007. Still, after closing at 1250 Wednesday, stocks need to commence a substantial two-day rally to get there. U.S. stocks have been buoyed recently by signs of improvement in the US economy, including declines in weekly claims for unemployment benefits and an uptick in new home construction. But investors say the market remains vulnerable as the debt crisis in Europe continues to threaten the outlook for the global economy and financial markets. One bright spot for Europe on Wednesday was an Italian auction of 3- and 24-month bonds that drew strong demand and yields half as high as the previous month's auctions. The results helped lift European equities and banks. Investors will be more closely watching Thursday's auction of Italian 10-year bonds, which have seen yields continue to flirt with the 7% danger zone. That level is worrisome because it flashed the first warning signs for Ireland, Portugal and Greece, which all eventually needed bailouts. U.S. stocks ended a listless session little changed Tuesday as investors weighed reports on consumer confidence and home prices. Asian markets ended mixed. The Shanghai Composite (SHCOMP) rose 0.2%, the Hang Seng (HSI) in Hong Kong fell 0.6% and Japan's Nikkei (N225) lost 0.2%. Currencies and commodities: Oil prices eased off the previous sessions spike, slipping $1.64 to $99.70 a barrel. On Tuesday, crude prices jumped 2% after Iran threatened to choke off the flow of oil passing through the Strait of Hormuz. Gold futures for February delivery fell $31.40 to $1,564.10 an ounce. The dollar fell against the British pound and the Japanese yen but edged higher against the euro. Companies: Shares in the financial sector remained under pressure throughout the trading day. Citigroup (C, Fortune 500), Credit Suisse (CS), Wells Fargo (WFC, Fortune 500), Morgan Stanley (MS, Fortune 500), Goldman Sachs (GS, Fortune 500) and Bank of America (BAC, Fortune 500) closed down between 1% and 4%. Bonds: The price on the benchmark 10-year U.S. Treasury moved up sharply, with the yield falling to 1.928% from 2.01% from late Tuesday.